Are you ready to let your earlobes sparkle? 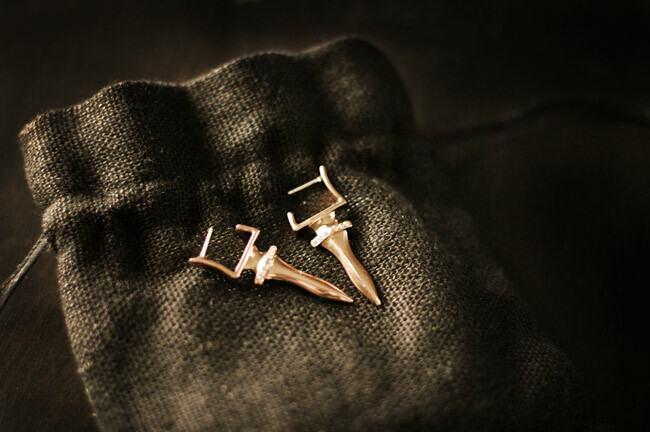 Today's Giveaway allows 1 lucky Reader to win a Pair of rose gold dagger earrings (for pierced ears!) encircled by pave Czech rhinestones. 1. LIKE the Sachin + Babi Facebook page. 2. COMMENT with your contact info below. The Sachin + Babi Spring/Summer 2012 Collection was inspired by the disco era, studio 54 and 70's glam icons like Bianca Jagger, Jerry Hall and Faye Dunaway. Oozing with easy glamour to the hilt! Sachin + Babi are a husband & wife duo based in NYC. Sachin wanted the brand to be for his wife - he wants his wife to wear the stuff he designs. A lot of the production happens back in their homeland of India, hence the Indian influences from the beading to their long dresses.